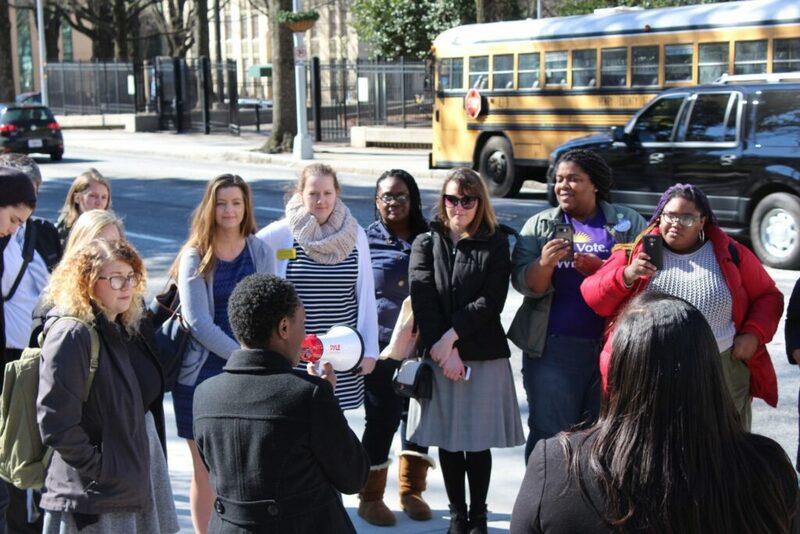 Our advocacy program focuses on achieving local and state level policies to bring about reproductive justice in Georgia. We achieve this through the work of a full-time lobbyist and by empowering Georgians to advocate with their government. Lobbying: We have a full-time lobbyist at the state Capitol to educate elected officials on the issues, fight against harmful bills, and promote good ones. Action Alerts & Advocacy Days: We work hard to make the Capitol accessible to everyone by sending out email alerts for important developments and hosting advocacy days monthly during the legislative session. On advocacy days, we bring a group of volunteers to the state Capitol, provide a short lobbying training, and then lead the group in speaking with their elected officials about current legislation. Workshops & Training: We offer training and workshops on current laws relevant to reproductive justice, the legislative process, and legislative advocacy. These trainings are available upon request. Civic engagement & Voter Education: The most powerful position in our government is in the voting booth! We train our volunteers to register new voters, canvass in our communities, and connect with voters via phone to make sure folks feel informed and empowered at the polls – Every Election! Volunteer or Intern with us: Our advocacy work would not be possible without our volunteers and interns, and we are always looking for more fabulous folks to join our team. Check out our volunteer and internship opportunities here. Join our Committee: Our Legislative Advocacy Committee meets monthly for trainings in advocacy skills, with topics ranging from voter registration work to reading legislation. This crew of dedicated volunteers supports our advocacy activities by helping with our annual events and regular outreach activities. Email megang@feministcenter.com if you are interested. Attend our events: Each year, we host a day-long Legislative Advocacy Workshop and our Unruly Night of Political Misbehavin’. Check out the event calendar for latest activities! Donate: When we change our state laws, we change our whole state. Support for our advocacy programs helps us create a better Georgia by holding more workshops, supporting our advocacy days, and helping us improve our outreach work.